For today's challenge I pulled a manicure from the archives. Apologies in advance: I painted this before I started my blog (last October) and I've come a long way since then. Look at those little nubbins and the horrifically dry cuticles. It's amazing what I've learned in just a few months. 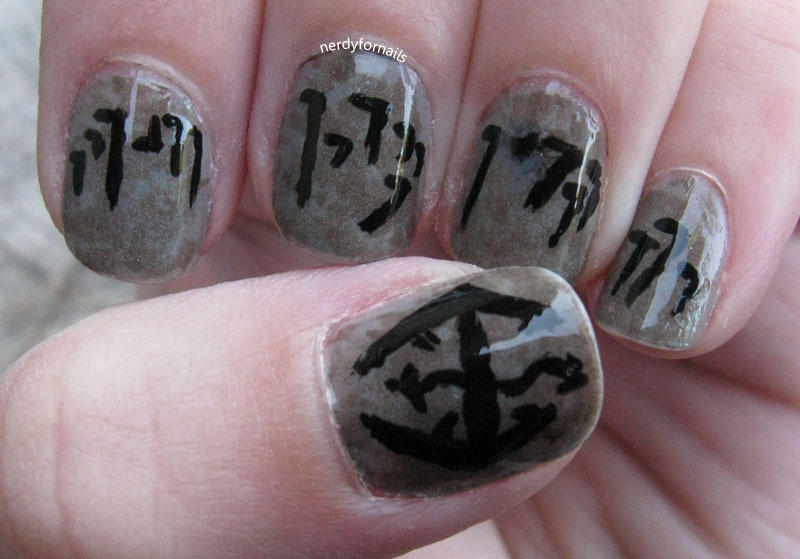 This manicure was inspired by the greatest game ever: Skyrim. I never got to play video games as a kid so as soon as I went to college I became pretty much full time addicted. My favorite series is Elder Scrolls and I played Oblivion three times all the way through so I was really excited for Skyrim to come out. 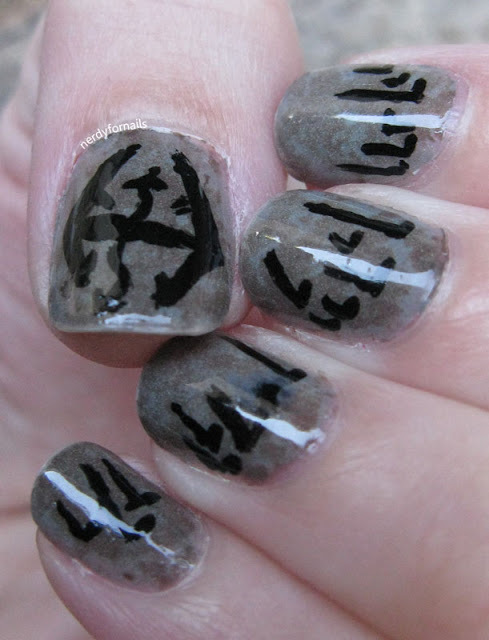 I painted the word wall for Fus Ro Dah (Unrelenting Force) using a base of China Glaze, Recycle. I used an eyeliner brush to dab on Spoiled, Pumping Gas for a textured rock look. Next I added a coat of Sally Girl glow in the dark polish and then added the symbols on top with a nail art brush. In the dark you could see the symbols standing out on top of the glowing base. Super cool, but unfortunately my photography skills were not up to the task of capturing it. I also painted the dragon logo on my thumb (fairly badly in retrospect). Despite all the flaws I kind of enjoy looking back at my old manicures. I took pictures for months before I actually started my blog with the intention of using them all over time, but they're definitely not up to current standards. I'm sure I'll look back at what I'm posting now and think it's awful compared to where I get to be in a few more months. What do you think? Should I make old manicures a regular feature? Maybe a learn from my mistakes kind of thing. This is so cool! The background is perfect, well done!